Whisk together the 3 Tbs balsamic vinegar, 6 Tbs olive oil, dijon, garlic, shallot, salt, and pepper. Place steak in a zip lock bag, pour balsamic mixture over, seal air tight and refrigerate overnight or 8 hours. Heat grill and then place marinated steak on grill top. Grill each side of the steak for 5 minutes, turning 90 degrees after 2 ½ minutes to create a diamond mark on the steak. When the steak has been grilled for a total of 10 minutes or is the temperature of 140 degrees, pull from the grill. Brush with 3 tsp of balsamic vinegar, season with salt, then cover and let rest for 10 minutes. While steak is resting grate beechers cheese and slice cherry tomatoes in half. Cut the steak into thin slices and serve over a bed of arugula. Garnish with cherry tomatoes, beechers cheese, a drizzle of extra virgin olive oil, and freshly cracked pepper. 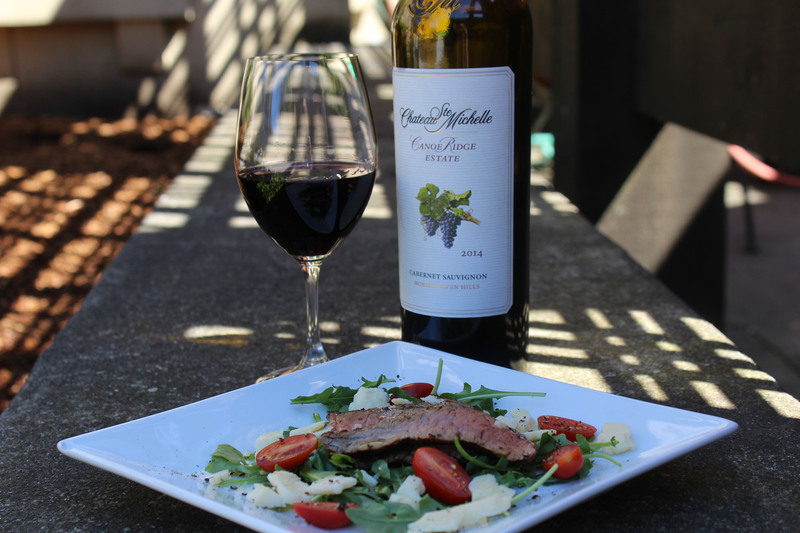 Enjoy with a glass of 2014 Canoe Ridge Estate Cabernet Sauvignon!